The average cost of assisted living in Erie is $3,457 per month. This is higher than the national median of $3,346. To help you with your search, browse the 22 reviews below for assisted living facilities in Erie. On average, consumers rate assisted living in Erie 4.5 out of 5 stars. Better rated regions include North East with an average rating of 5.0 out of 5 stars. Caring.com has helped thousands of families find high-quality senior care. To speak with one of our Family Advisors about assisted living options and costs in Erie, call (855) 863-8283. Erie is the county seat of Erie County and is located on the southern shores of the Great Lake it’s named for. Recently, AARP named Erie as one of the best low-cost cities to retire to. There are 11 assisted living facilities, referred to as personal care homes, in the city. These facilities are licensed and regulated by the Pennsylvania Department of Human Services. Seniors considering residing at one of Erie's assisted living facilities can expect help with basic activities of daily living. Some facilities also offer specialized care for conditions such as disabilities and dementia. Seniors living on a fixed income may be pleased to note the city of Erie is associated with an affordable cost of living index at 86. This is below the national average index which is 100. Erie’s Lakeside Senior Center features arts and crafts classes, discussion groups, health and wellness activities, community outings, and special events. Erie is home to world-class medical facilities, including Saint Vincent Hospital, in the event of medical emergencies or illness. Pennsylvania does not tax social security checks. This leaves more money in seniors’ assisted living budgets. In addition, the state does not generally tax withdrawals taken from work retirement and 401k accounts. Public transportation in Erie is reliable. Erie Metropolitan Transit Authority offers bus service throughout the city. Seniors with Medicare cards ride at a reduced rate. Summers in Scranton tend to be comfortable with July summer highs of 80. Winters, however, can involve January lows that average 21 degrees and inclement weather like ice and heavy falls that can make it difficult for seniors to traverse. Assisted Living costs in Erie start around $3,457 per month on average, while the nationwide average cost of assisted living is $4,000 per month, according to the latest figures from Genworth’s Cost of Care Survey. It’s important to note that assisted living rates in Erie and the surrounding suburbs can vary widely based on factors such as location, the level of care needed, apartment size and the types of amenities offered at each community. Erie seniors who meet the eligibility requirements can qualify for financial assistance to pay for care at an assisted living facility. 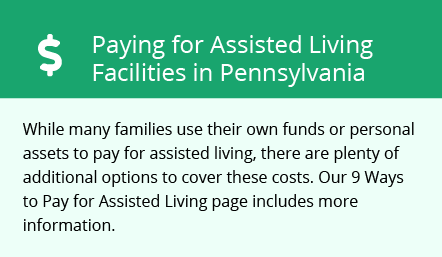 Pennsylvania's medical assistance program, the Medically Needy Program, offers financial assistance for qualifying seniors or individuals with disabilities to help pay for care in a nursing home or assisted living facility. The Pennsylvania Department of Aging Medicaid Waiver can also help eligible seniors pay for care. Moreover, seniors who receive SSI benefits and need to live in an assisted living facility may qualify for a supplement that can be used to pay for assisted living care. To see a list of free assisted living resources in Erie, please visit our Assisted Living in Pennsylvania page. Erie-area assisted living communities must adhere to the comprehensive set of state laws and regulations that all assisted living communities in Pennsylvania are required to follow. Visit our Assisted Living in Pennsylvania page for more information about these laws.